The European Commission will reject Google's latest proposals aimed at settling a three-year antitrust dispute, the Commissioner in charge of the case said Friday. "The latest proposals are not acceptable in the sense that they are not proposals that can eliminate our concerns regarding competition and in particular regarding the way Google's rivals in vertical search are being treated," Competition Commissioner Joaquin Almunia told Spanish radio station Radio Nacional de España. The news comes following a second so-called 'market test' in which rivals and other interested parties were asked to review the search giant's proposals. Google has been under investigation by the Commission since November 2010, after rivals accused the search giant of directing users to its own services by reducing the visibility of competing websites and services. It was also accused of content-scraping and imposing contractual restrictions that prevent advertisers from moving their online campaigns to rival search engines. The company's latest settlement offer, submitted in October, proposes to present three rival links for each query. These will be clearly separated from Google's own services, which will also be clearly labelled. Where Google monetizes its services, the three rival links will be selected by auction, with reserve price of €0.03 per click. However users will be able to hide the rival results with a single click and none of the proposed remedies will be applicable to the google.com website, only to its sites in other country-code top level domains such as google.fr for France or google.co.uk for the U.K.
Google spokesman Al Verney said the company had taken into account the Commission's concerns. "We've greatly increased the visibility of rival services," he said. 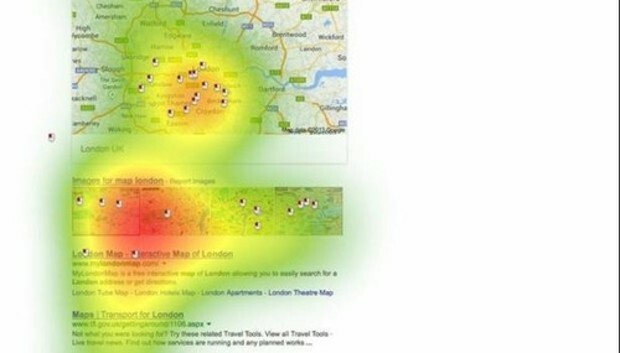 However according to an eye-tracking study commissioned by a group of Google's competitors (ICOMP) the proposed new search results page layout would benefit Google more than its rivals. The study, conducted by The Institute of Communication and Media Research, examined where people look on the page of search results, how long they look at individual links, and where they click as a result. The search results pages used in the study were taken directly from Google's proposals in its second round of commitments. "These new proposals give Google the power to further monetize its abusive behavior by forcing small and large competitors to pay Google for the right to feature in these 'rival links' listings. The most relevant search results will be replaced by preferential slots either reserved for Google itself, or sold to the highest bidder. We maintain that the only workable solution to restore effective online competition and to give consumers what they are expecting is for all services to be given equal treatment in terms of search ranking placement," said ICOMP Legal Counsel David Wood in a statement. It seems Almunia has taken note. He said no sanctions will be taken at this stage, but warned Google that "there is little time left." Almunia is attempting to resolve the case under a so-called Article 9 procedure, in which the company under investigation can present proposals to rectify the situation. If these proposals are accepted by the Commission, they become legally binding. But if a solution isn't found, the Commission could fine the company up to 10 percent of its annual global revenue.